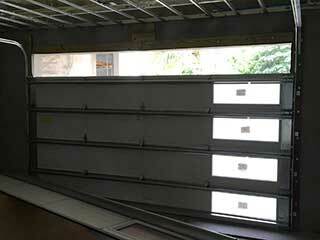 Problems with the garage door panels are often hard to notice without proper inspection. Unfortunately, damage can spread fairly quickly and become hard to fix. That is why you should not leave things to chance even if you have taken all necessary measures for weatherproofing your door and maintaining it, including regular repainting and installing weather seals. Learning how to spot issues will help you avoid more costly repairs later on. A steel garage door is one that's most commonly found on residential properties. The biggest issue that can affect steel door panels is rust. However, it is not always as obvious as people think. The first thing to check is the condition of the paint. If there are any cracks or any sections with peeled-off paint, then you should look more closely for rust as well. The next spots to inspect are the bottom, top and sides of the door, and of each section as well. Even if you have a bottom seal and other protective weather seals, moisture can still affect the sides if the seals have not been properly installed or have worn-out. Any rust spots must be quickly removed and the panels repainted for effective protection. If required, the weather stripping must be replaced as well. The beauty of a wooden door is truly incomparable, but panels made from this material are vulnerable to moisture damage and pest damage too. You need to look closely for fading sections in the paintwork and for darker spots on the surface of the wood. These indicate the presence of moisture. If the darker spots are soft to touch and tiny splinters come off even with gentle touching, then decay must have set in. In this case, immediate garage door panel repair is required. Certain types of ants and termites can also cause damage to wooden garage door panels and frames. They leave small holes behind plus wood dust and tiny droppings. If you find evidence of this type of damage, you will need to take some measures to treat not only your door but perhaps the rest of your property as well. If you have an aluminum garage door, you're in luck, as this material does not require a lot of maintenance. It's not without its flaws, of course, as this material will dent and damage rather easily, so you should inspect the panels closely for fine cracks and bumps. These can make your door vulnerable to the elements as well as to burglars, so doing this every so often would be prudent of you. If you need some assistance, or simply want to consult with one of our experts at Garage Door Repair New Braunfels, all you need to do is give us a call. We'll do everything we can to help. The high-quality garage door repair and installation services our professional technicians can provide you with are guaranteed to meet your complete satisfaction. Our wealth of knowledge and experience have made us the preferred choice for any homeowner who's looking to get their door completely fixed for an affordable price. Take a look at the rest of our website to see what we can do for you today. Our technician will contact you before arriving. Until then, feel free to browse our website! Garage Door Repair New Braunfels is at your service!